C-Quence Eye Gel is a technically advanced, fast-absorbing eye gel containing a variety of specially selected essential vitamins, antioxidants and peptides to assist in improving the appearance of fine lines around your eyes and providing a daily defence against ageing skin by keeping the delicate skin around the eye hydrated and cared for. Helps to improve skin firmness and tone. Assists in reducing the appearance of wrinkles, especially around the eyes and even on the forehead. 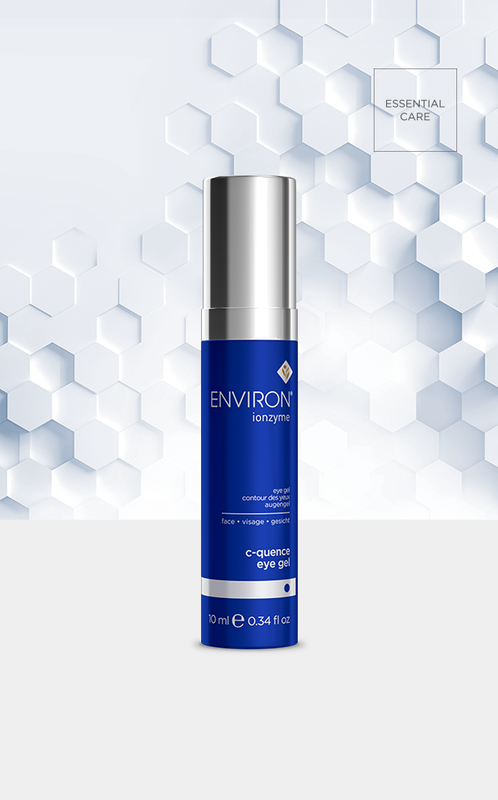 After cleansing and toning with your preferred Environ products, apply C-Quence Eye Gel to the whole eye area, including your eyelids – use morning and evening. A rich and delicately fragranced cleansing lotion that removes make-up and impurities, leaving your skin feeling clean, nourished and moisturised. This vita-peptide enriched toner has both moisturising and anti-ageing properties that will leave your skin feeling refreshed and will help improve its overall appearance. This light, luxurious, antioxidant-enriched moisturising crème assists in combating free radical damage and helps to keep skin moisturised and feeling soft and smooth. Step-Up Level 1: This serum contains the lowest concentration of vitamins A, C and E as well as antioxidants and peptides that work in synergy to help maintain a smoother looking and more youthful appearance. Step-Up Level 2: This serum contains a medium concentration of vitamins A, C and E as well as antioxidants and peptides that work in synergy to help maintain a smoother looking and more youthful appearance. Step-Up Level 3: This serum contains a high concentration of vitamins A, C and E as well as antioxidants and peptides that work in synergy to help maintain a smoother looking and more youthful appearance. Step-Up Level 4: This serum contains a very high concentration of vitamins A, C and E as well as antioxidants and peptides that work in synergy to help maintain a smoother looking and more youthful appearance. This gentle micro-exfoliant masque containing vitamin C is formulated to refresh and energise the skin and improve the appearance of uneven skin tone, revealing a smoother texture and more radiant complexion.